Village of Reeseville- 2019 Main Lift Station Impv. A review of the community’s water demands for residential and business use as well as for securing adequate fire protection uncovered a shortcoming in Berlin’s then-current availability. 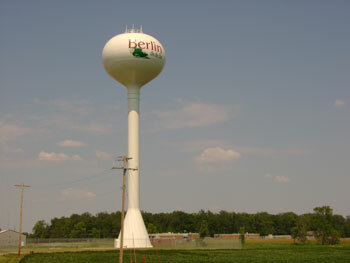 This brand new water tower was needed to provide additional storage, capacity and increased pressure for Berlin’s industrial park and for the community as a whole. The 500,000-gallong elevated, spheroid shaped water tank was built with funds procured by Kunkel Engineering Group from and Economic Development Authority (EDA) grant that helped offset the cost to taxpayers. We are engineering consultants with more than 25 years of experience helping Wisconsin communities overcome big challenges. Think of us as your city engineer... without the title or the benefits package. "Building Relationships that Build Communities™"